It is the LdM Jewelry Department’s conviction that used can become beautiful (again). Through the creative minds of our students, found and discarded objects have gotten the possibility of becoming once again an item of beauty. 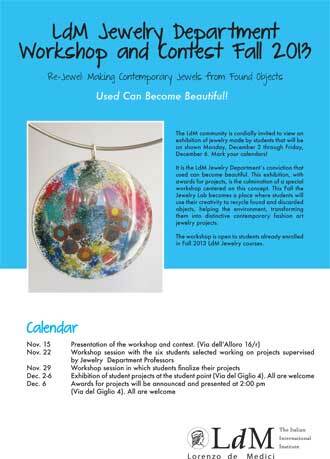 This Re-Jewel exhibition, with awards for the most successful projects, is the culmination of a special workshop centered on this concept. The award ceremony will take place at 2 pm on December 6.